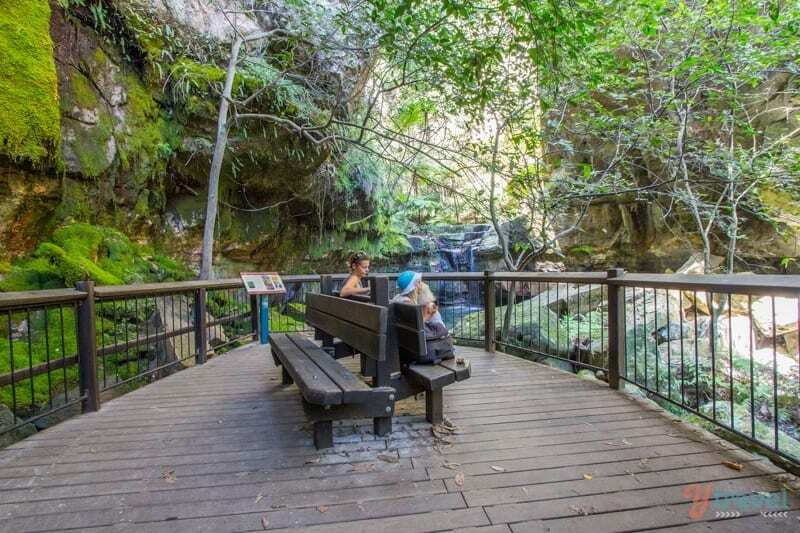 Several of our readers suggested we visit Carnarvon Gorge National Park on our travels through Queensland. 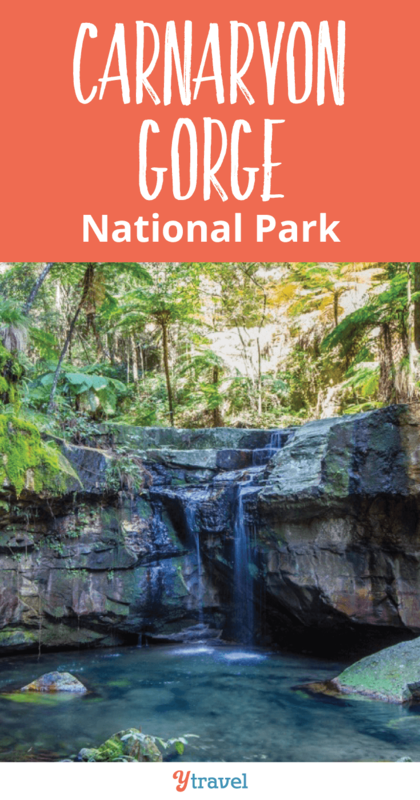 Now that we’ve been, we can say a tropical oasis awaits you and Carnarvon will be added to our list of favourite National Parks in Australia. It’s a special place, and certainly worthy of more than the two nights we stayed here. We arrived after a month of 40+ degree temperatures in Central Australia and Outback Queensland. 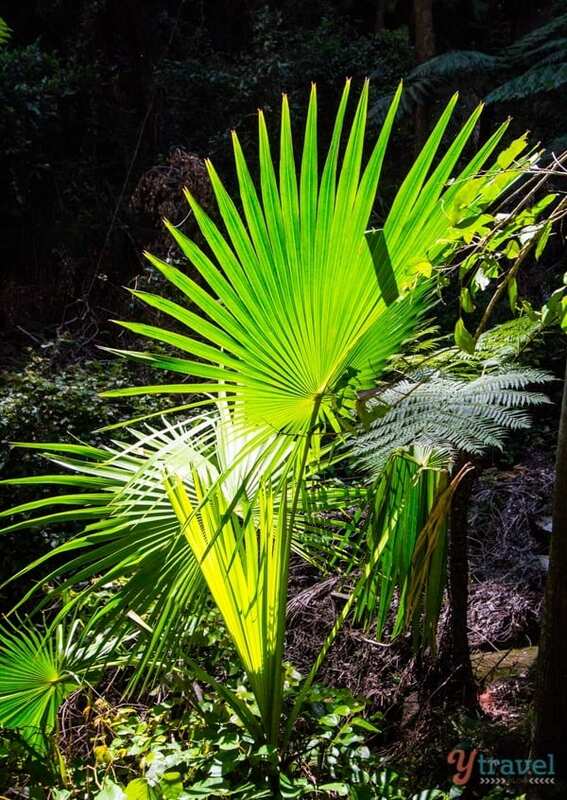 Dry heat and arid landscapes soon turned into a lush, green moist oasis. The palm trees and cooler temperatures at Carnarvon had us sighing like we would if we were collapsing into a hammock with a cocktail on a tropical island after a long year of work. On our first evening, we sat by the creek just behind our camper trailer, chatting with some ladies who had been here a few days hiking. 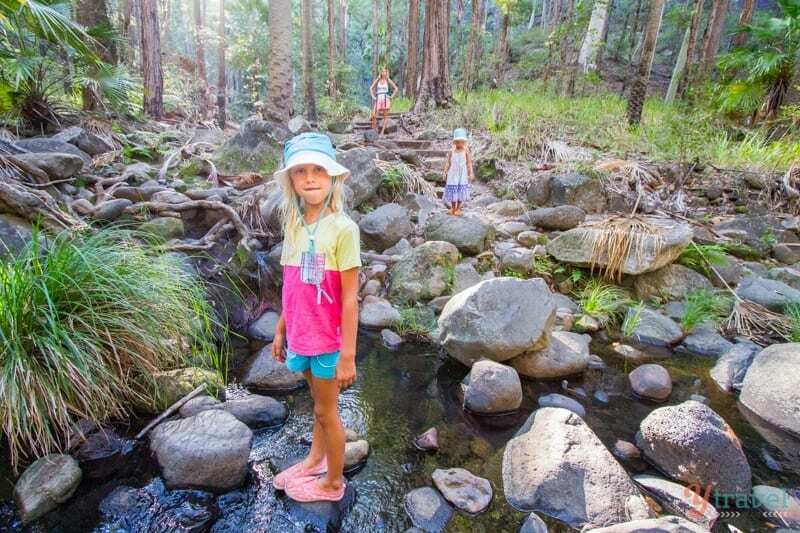 They spoke about hiking in the heat and asked how we were managing it with the kids. Not only was it cooler, but it was now humid heat. I’m one of those weirdos who loves humidity. It bathes me in sweat and makes me feel sticky, but it does not drain me and wipe me out like dry heat does. That stuff just saps out all my moisture and spirit. So before even doing much we loved Carnarvon. 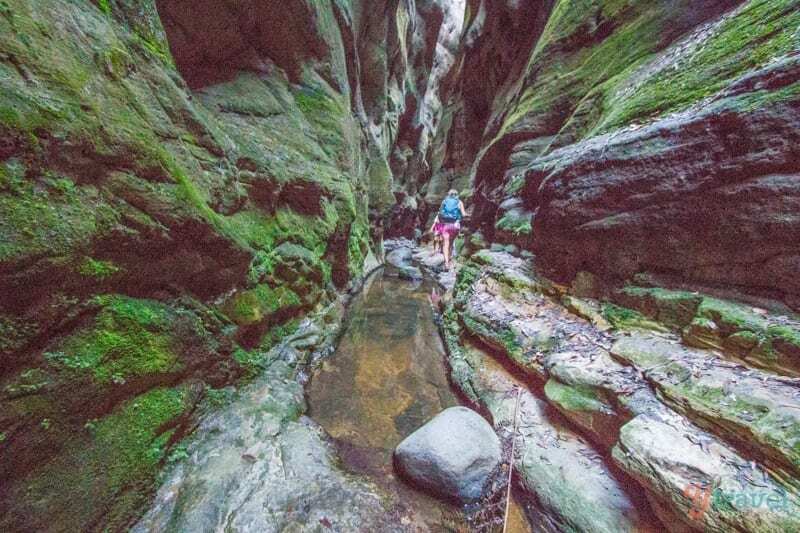 We discovered over the next day and a half hiking through the gorge, there was so much about it’s natural landscape to love. There was the lush green grass that reached your ankles, sometimes your knee. 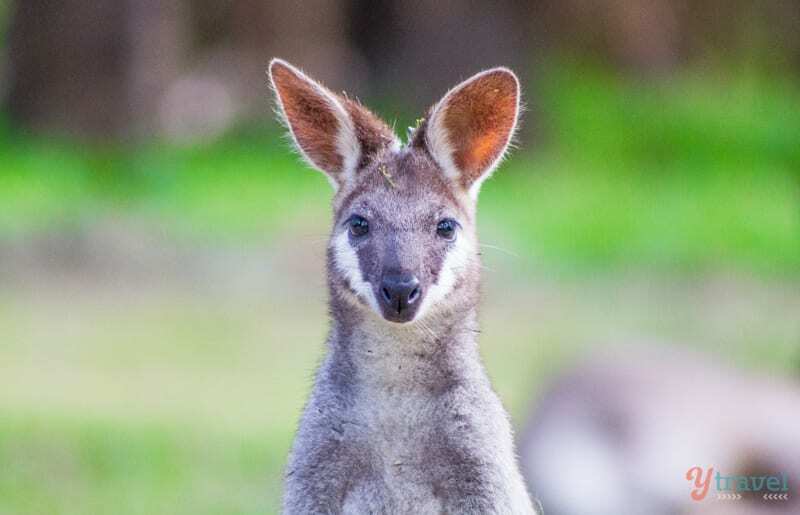 The hundreds of kangaroos and pretty face wallabies jumping around were just as enthusiastic about it. 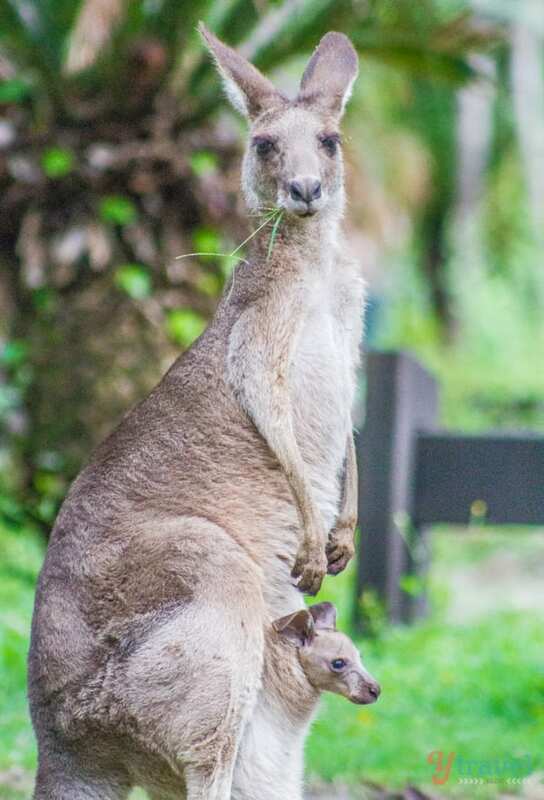 We’d been travelling around Australia for 18 months now and have seen thousands of kangaroos, yet every time we see them we get as excited as if it were our first time. 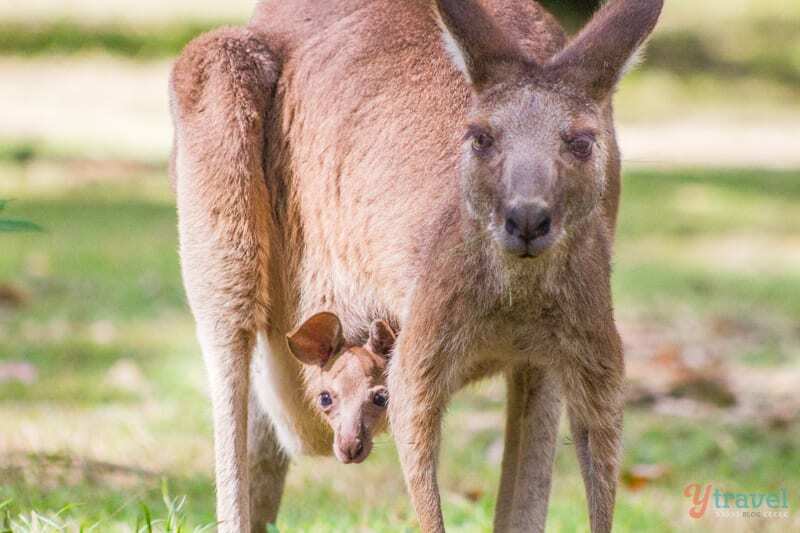 I would put Carnarvon Gorge up there with one of the best places to see wild roos in Australia. 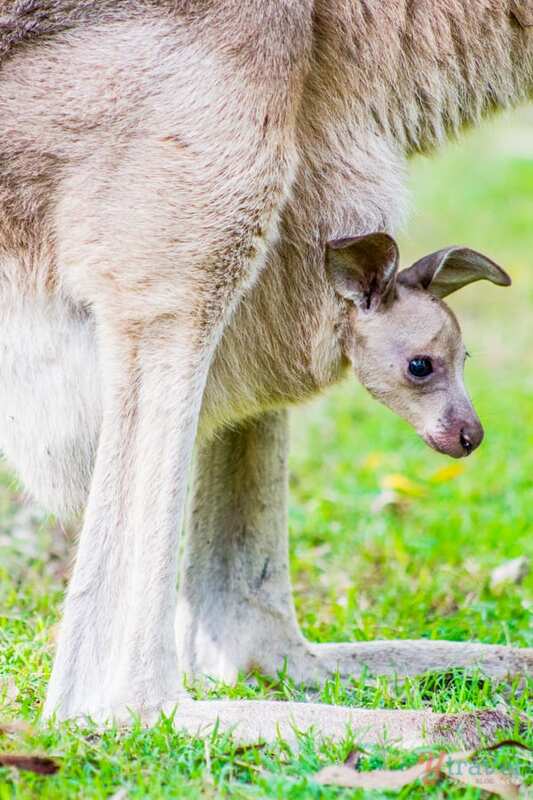 There were THAT many of them, and lots of joeys which our kids loved! Click on the link below to be directed to each topic or scroll manually. 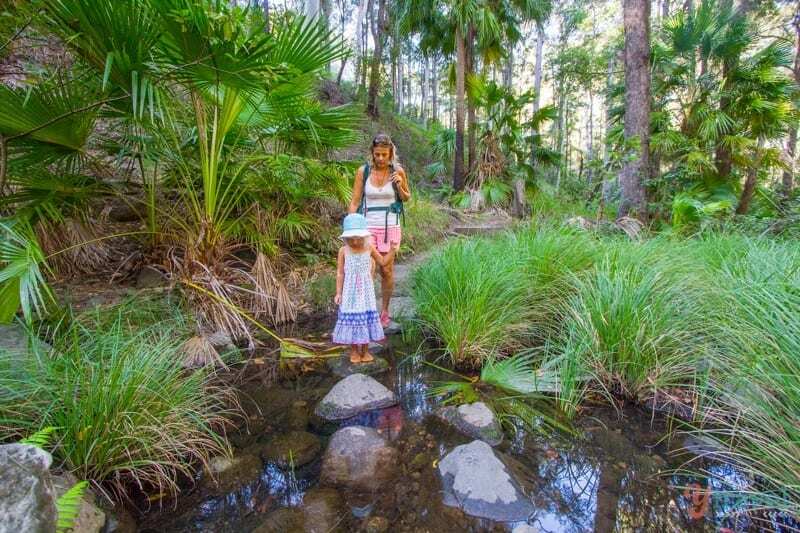 There were times walking along the gorge trail to Moss Garden where the palm trees, ferns, gum trees, and cycads told me were back in tropical Queensland, yet there were moments, like when we were crossing the creeks on the stepping stones, and I paused to take in the views and surrounding me were pine trees and white steep sandstone cliffs and I thought I was back in Yosemite in California. I felt like Carnarvon was created for me, combining my favourite colours, landscapes and trees in one place. We didn’t do too many hikes or too strenuous ones. 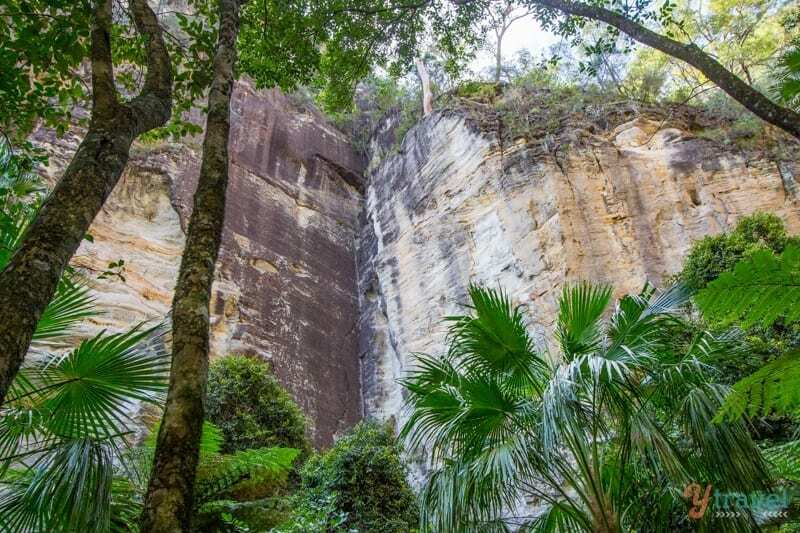 I’d love to return to do the complete 18km return walk to Cathedral Cave, an overhang that sheltered the Aboriginal people for thousands of years. This was a fantastic walk we did the afternoon we arrived in Carnarvon. 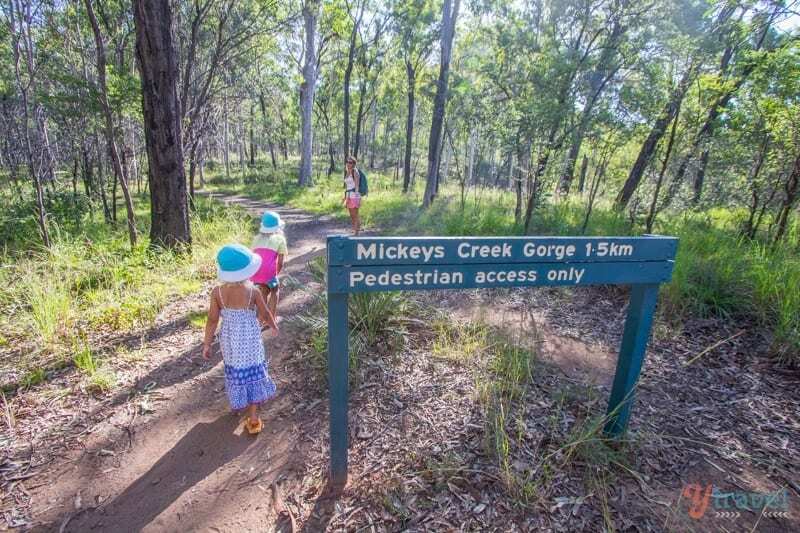 It’s on the trail to Mickey’s Creek and you turn off to the right about 1km in. We were told Warrambuh was better than Mickey’s. It’s only a short 1.5k/m return walk and can be done in around an hour. 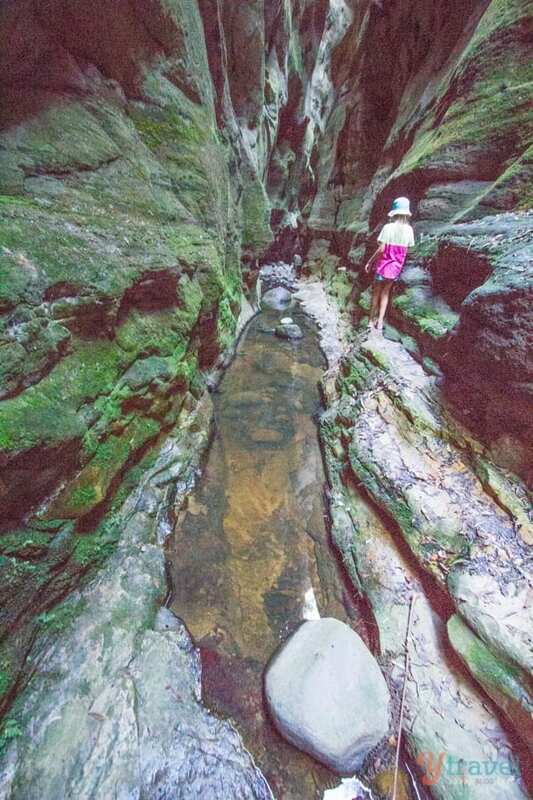 Your kids will love this one as you walk in the steep narrow gorge and have the walls slowly close in on you. 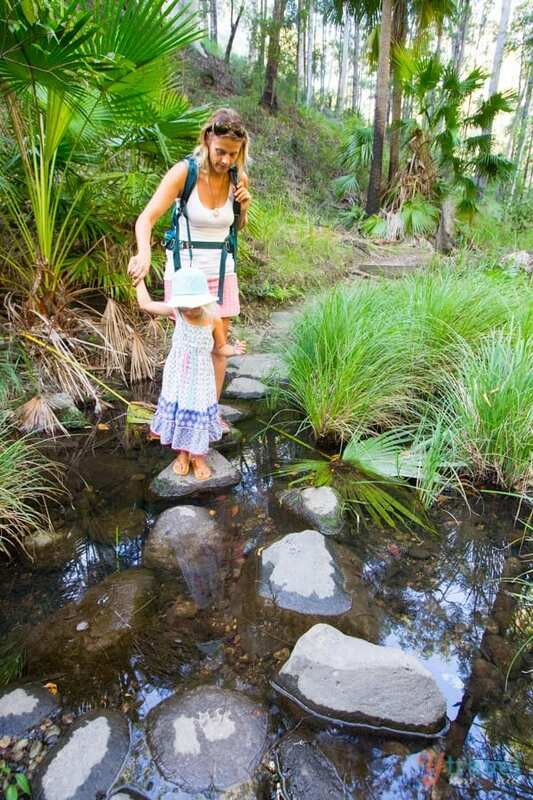 And of course all kids love stepping stones. 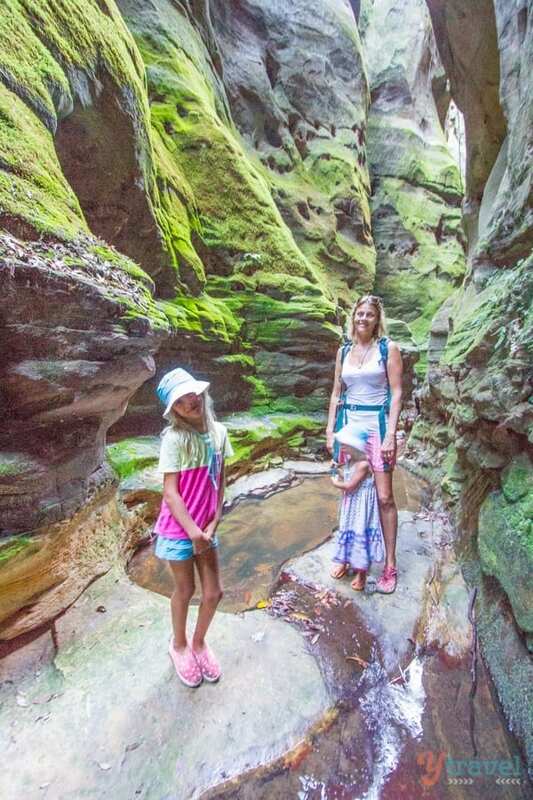 The Moss Garden walk gives you a great perspective of the gorge and surrounding landscapes. 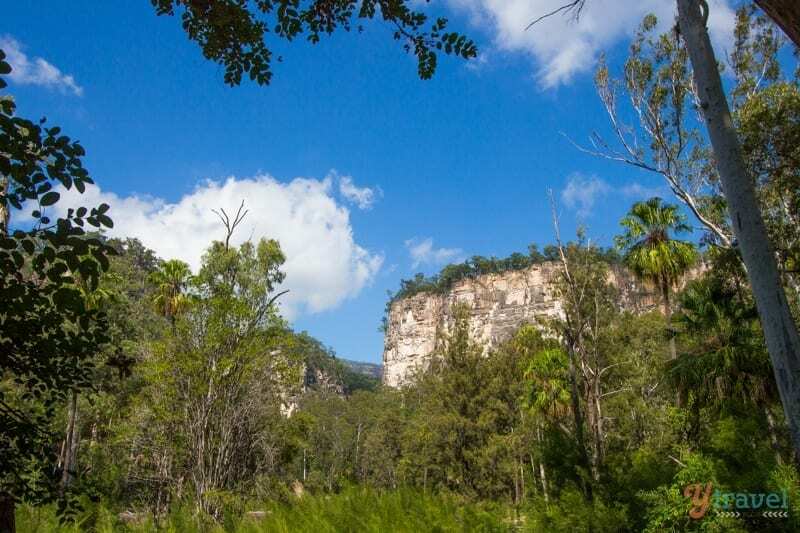 It’s a fairly flat and easy walk along the main Carnarvon Gorge trail and the views are spectacular. The trail crosses the boulder strewn creek several times and leads to different walking trails. 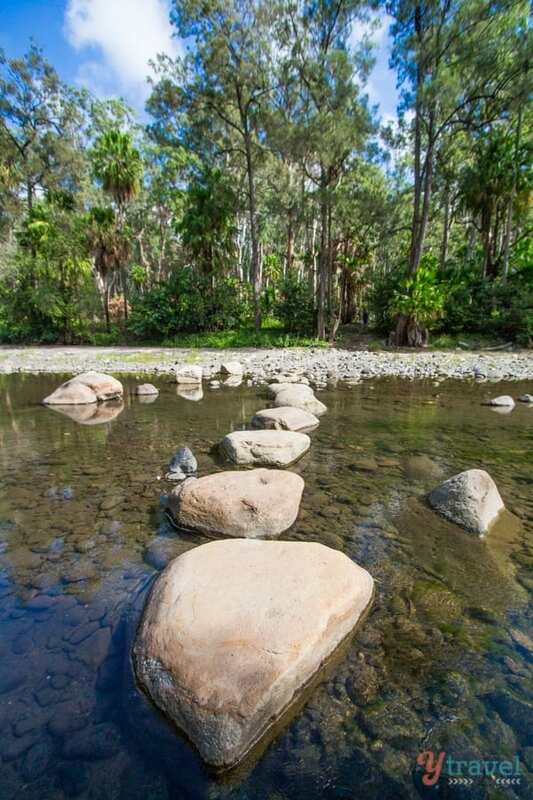 The girls again loved all the stepping stones and it was the only time Savannah eagerly agreed to walk. Moss Garden is the perfect place to sit after your hike. 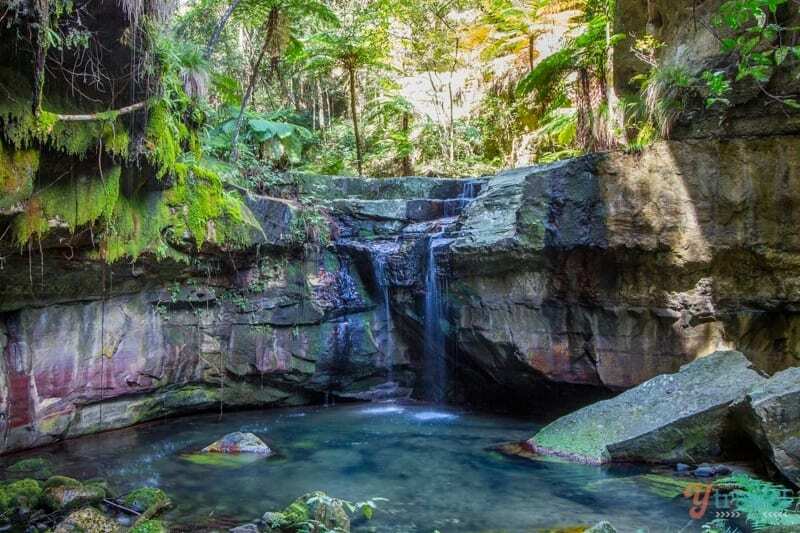 Pull out your snack and cool off in the shade by the small watering hole surrounded by towering dripping sandstone cliffs, and a lush covering of ferns, liverworts and mosses. 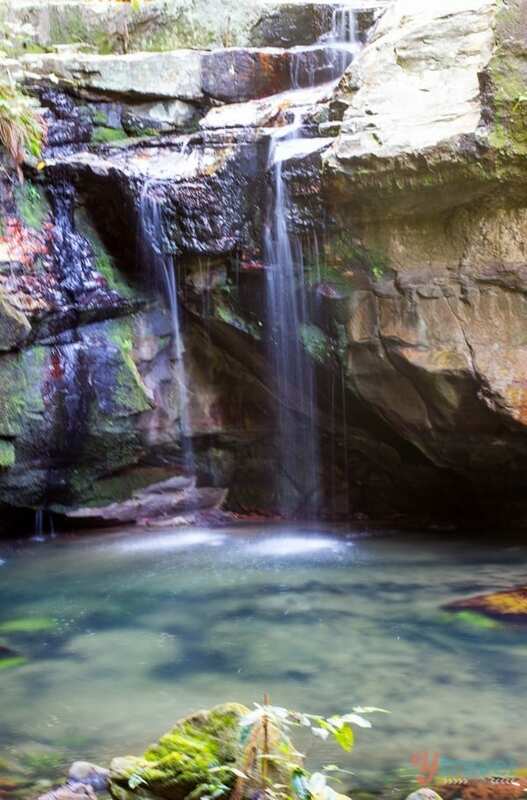 A small waterfall tumbles over the rocky ledge. 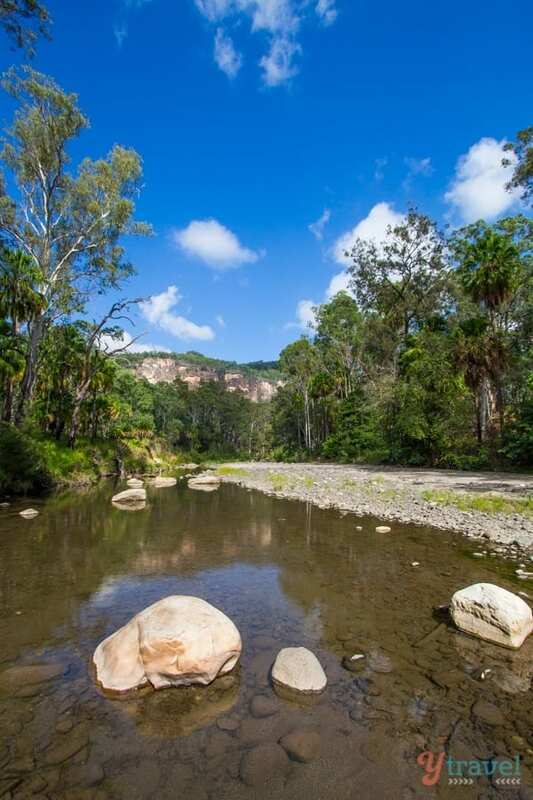 Rest in the shade of fig and casuarina trees and watch for platypus and turtles. It’s the only place in the park designated for swimming. 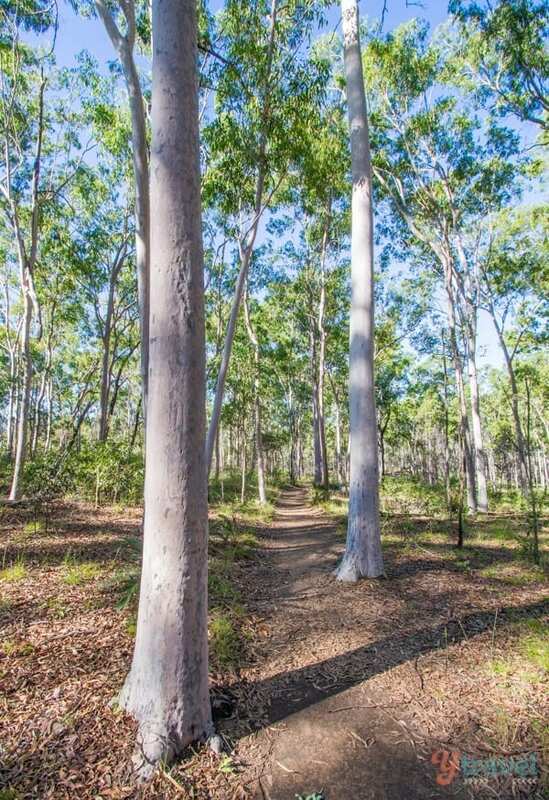 Get up early to start this one as you do hike up some steep sections to the top of the cliff for views out to the distant ranges at Boolimba Bluff, which towers 200m above Carnarvon Creek. Really bummed we did not get to this one, but it was just that little bit too far for the girls. 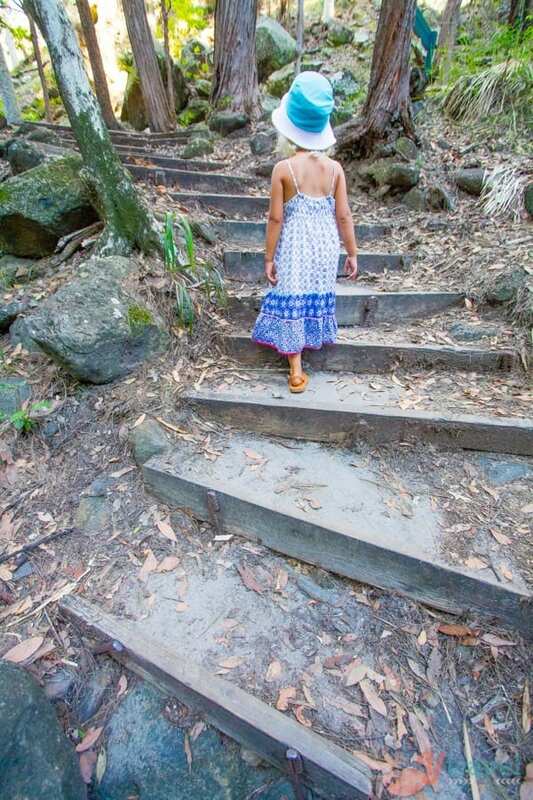 It comes recommended as a highlight of the park and contains what is said to be one of the best examples of Aboriginal stencil art in Australia. Over two thousand engravings, ochre stencils and freehand paintings adorn the 62m-long sandstone walls of this significant Aboriginal site. Sounds pretty speccy! 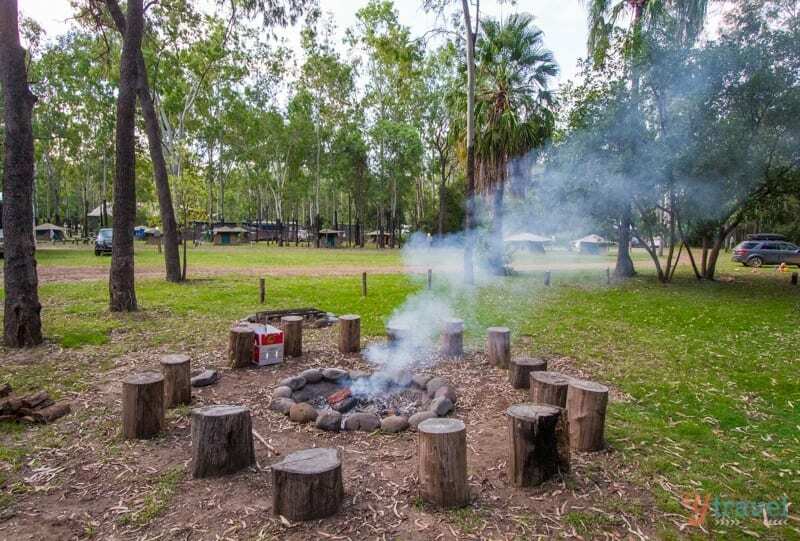 The Takarakka campground is in such a beautiful setting just minutes away from the National Park. 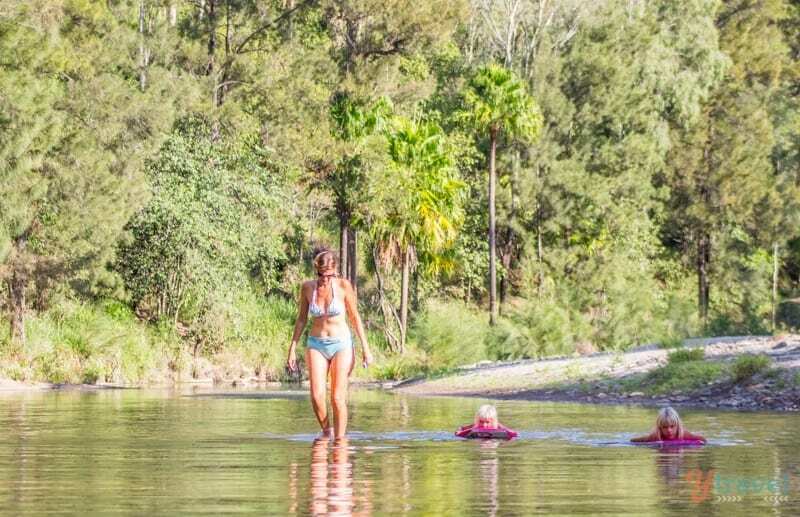 Surrounded by green jungle and Carnarvon Creek, we lapped it up after weeks, and months in the dry, barren Outback and Top End of Australia. It’s the only campground open year round. There’s plenty of space and shade and beautiful, clean amenities. There’s a small store for supplies and free wi-fi (slow) near the store. Otherwise, you’re unplugged. Which causes anxiety for us, but for you, it’s perfect! If we didn’t have our online business, we’d be lapping up that natural unplugged serenity. Truth is we still did! 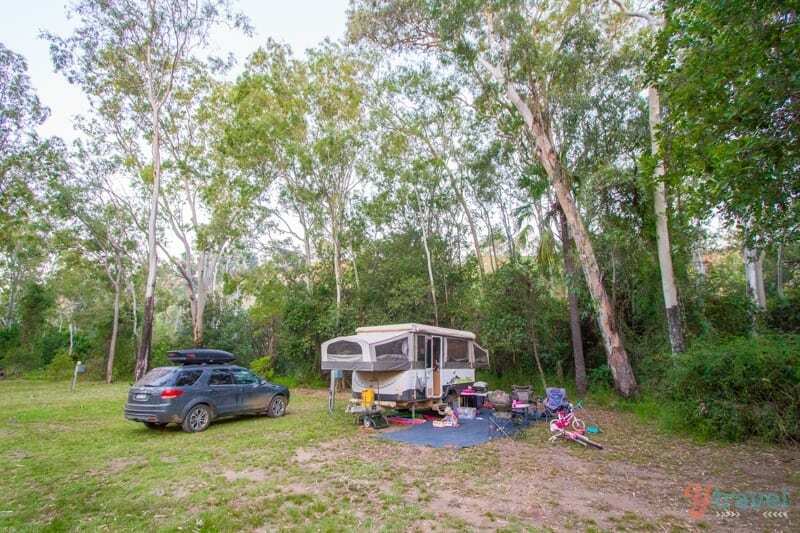 Even though we’d only been staring at the stars in Charleville a few nights before our arrival in Carnarvon Gorge, we were so excited to experience it again with the evening star gazing talks at Takkarakka. Actually, we all kind of skipped down the dark dirt road, with the light of our flashlight guiding us to the observatory. We learned even more about stars and galaxies and the enormity of our Universe. We even got to look at a star they say is in the process of supernova-ring. Because it is so many light years away, the star is actually already dead! We’re still looking at it from the past. So super cool. And some of those stars up in our sky looking back at us are seeing the earth during the dinosaur era. So freakin cool! We got to see the moon again and our talisman, Jupiter, looking as fine as ever with his four visible moons guarding him. It was so great to return to sit outside the camper with our dinner and continue our conversations about the Universe and magic, with little rofous bettong, or rat-kangaroo jumping around. 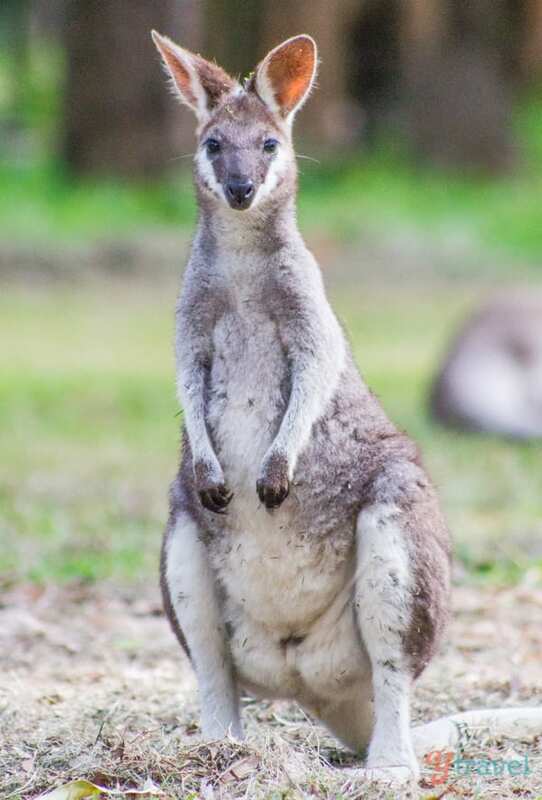 The size of a rabbit, the bettong is the smallest of the kangaroo species in Australia. 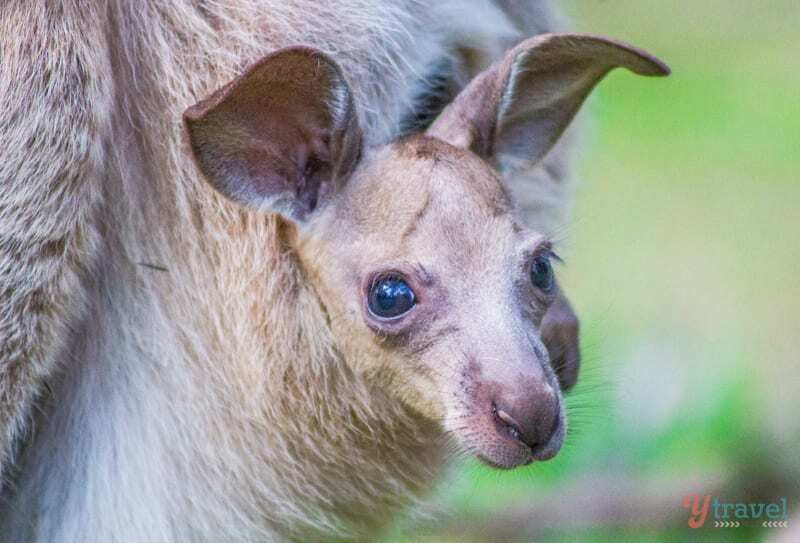 It’s not the only shy, elusive Australian animal you have a very good chance of seeing here. It’s highly likely you’ll see some platypus as well. 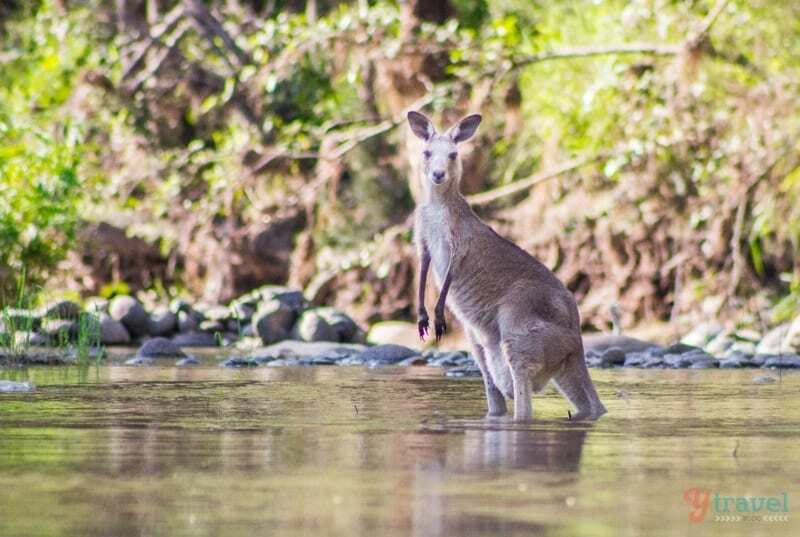 They hang out in the creek just behind the campsite. They’re pretty easy to find if you are quiet and still. We didn’t and are still yet to see them in the wild. 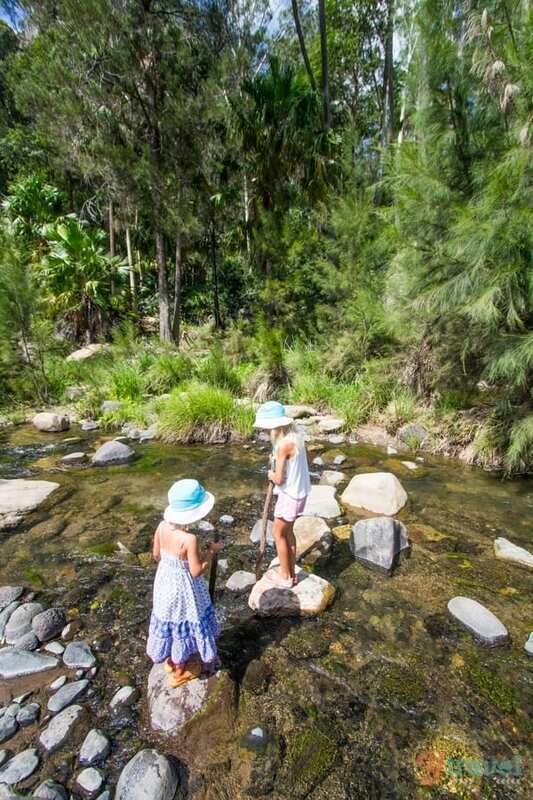 We did enjoy cooling off in the creek after our big hike into Moss Garden however. 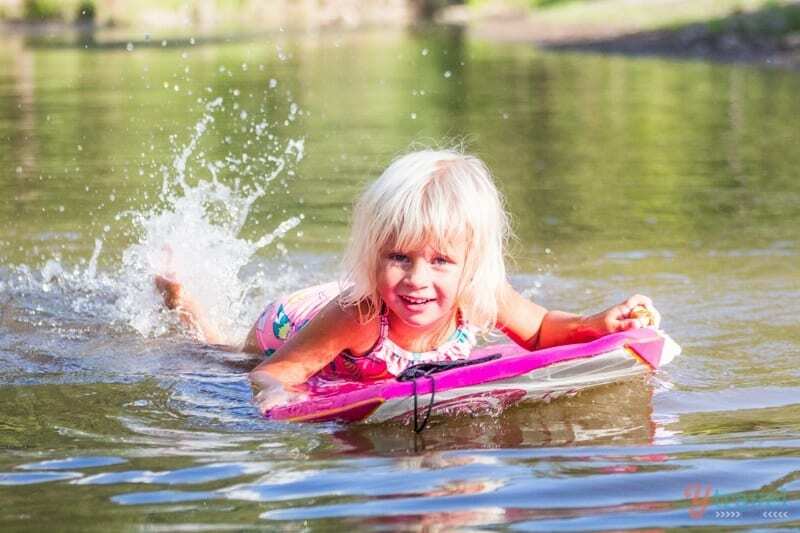 It was shallow and perfect for the girls to swim and kick around on their boogie boards. 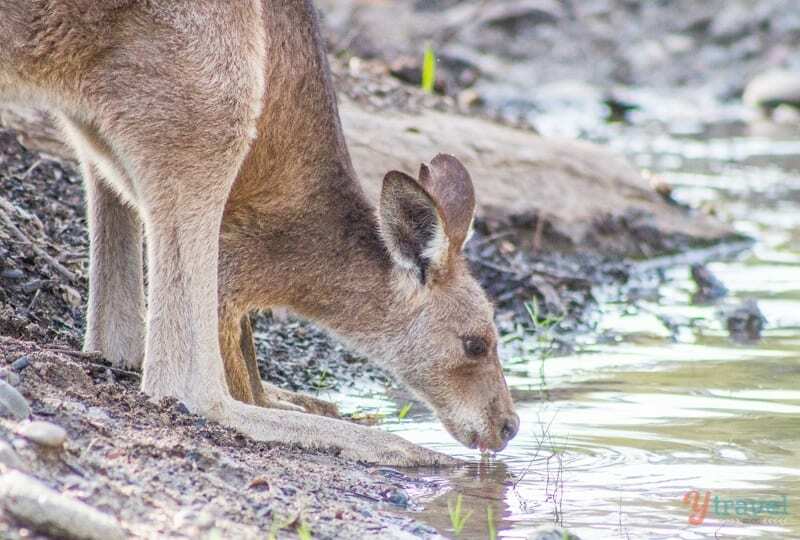 We all had a joyful moment when the locals (more roos) came down to join us and drink from the water. 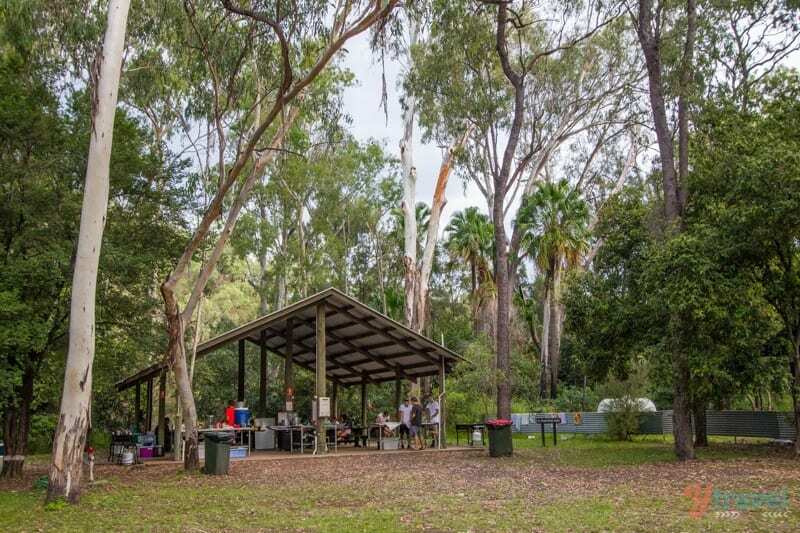 The campground also has many other fun activities and programs during the season, like Sunday roast dinners, guided tours and heli-flights. The helicopter takes you over Carnarvon and Moolayember Gorge, which cannot be accessed by land. The nearby Bandana Station has sunset tours. 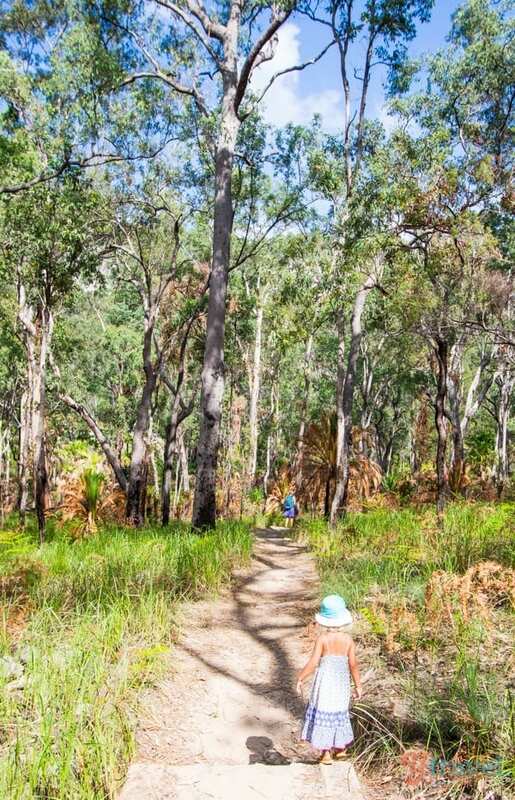 Reflect upon the timelessness of the ranges whilst splashes of colour illuminate 30km of escarpment. Enjoy it with instrumental music, a glass of wine, a cheese platter and a billy tea and damper to wrap up the evening. No one does billy tea and damper like the Queenslanders! We were saddened to miss this by one night. It opened for the season the day we left. Our community raved about it. Astronomy tours: $25 adults, $10 children under 16. Children under 5 free of charge. 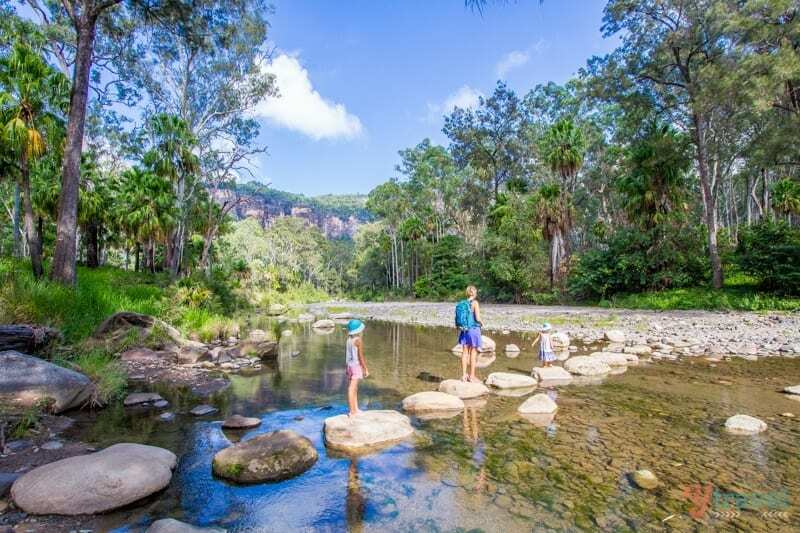 We visited Carnarvon Gorge in partnership with Tourism Queensland as part of our Outback Queensland drive and we’re so grateful we finished off our 18 month road trip through the Outback. 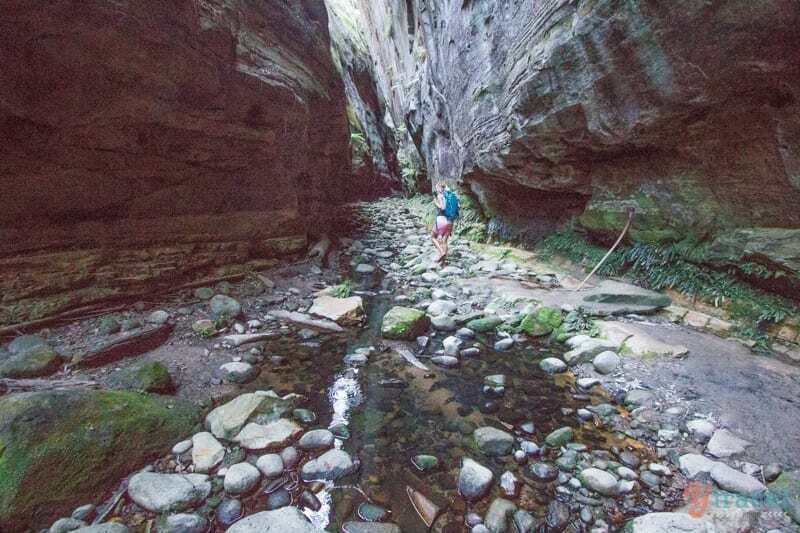 Carnarvon Gorge is a place we’d love to explore more of. 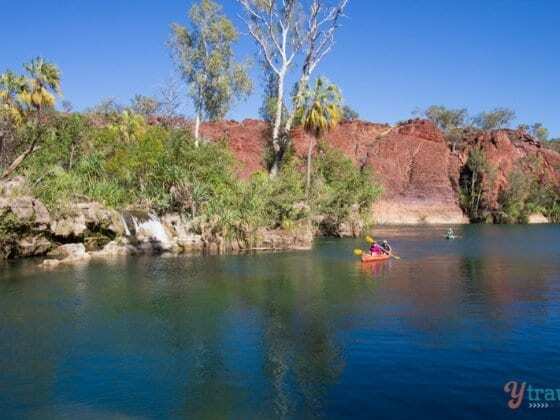 See our other Outback Queensland posts here. Check out the properties with booking.com You get free cancellation on most rooms and a best price guarantee. 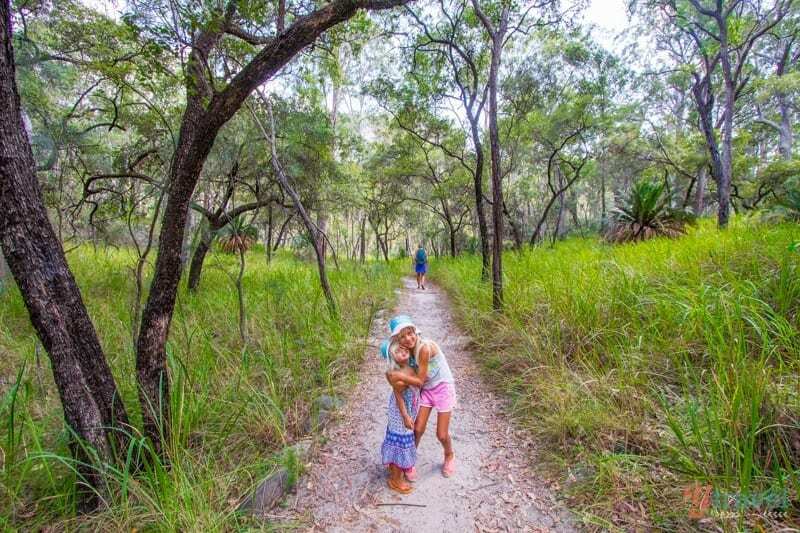 Is Boodjamulla National Park Queensland’s best kept secret? 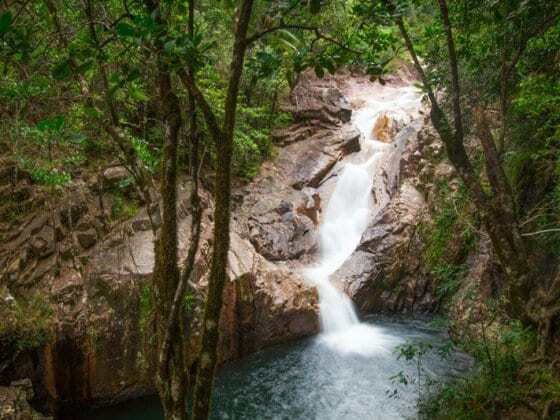 Why have I not heard of Finch Hatton Gorge before? 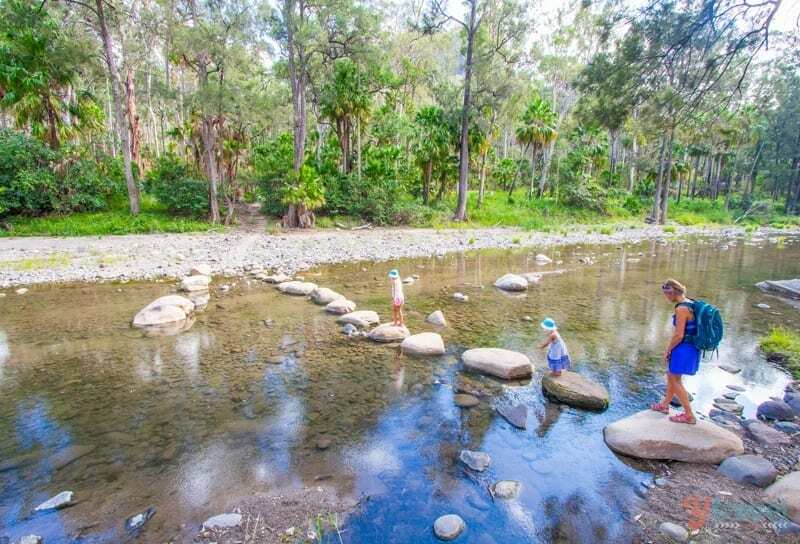 Another Queensland surprise near Mackay! Sold! I’ve been living and working in Melbourne for four months now, but with the weather getting colder and colder, I think I’m getting ready to move on. Adding to this to my warmer climate wish list 🙂 I’m like you – can’t wait to get back to that humidity! Great to hear Tabbu. Hope you make it back to Queensland and Carnarvon soon! I love trips like that where you actually get to get more in touch with nature. Being anywhere where there is water is my main thing because nothing makes me feel better than anything that has to do with water: the sound, calming and relaxing, the nice moisture that surrounds it, the beautiful view it offers, whether it’s a waterfall or lake, river, anything. I love the pictures you took, so fresh, so natural. Exactly what the doctor prescribed! Thank you. And I agree with your opinions around water and nature. So calming! oooh your pics are so lovely! I know right. We knew nothing about it until our visit. Hopefully we’re helping to put it on peoples radar now. Hope you make it here one day Mehedi! Lovely pictures. Lovely place would love to go here. Definitely a must visit. Nice Travel Snaps! 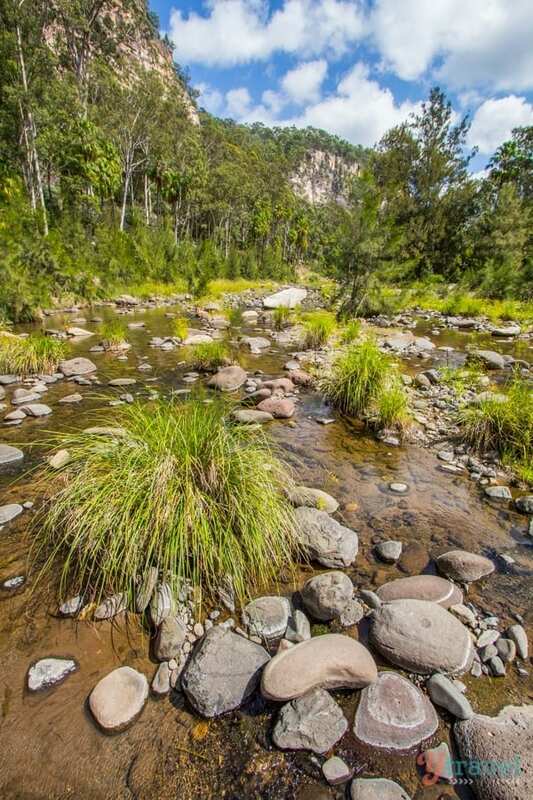 I liked very much Carnarvon Gorge National Park as a warm destination in Queensland. I wish to visit here next year. This place is very crazy enough to travel with my little family. Also, I would like to stay one night at Takarakka Bush Resort. Thanks Dear Craig! 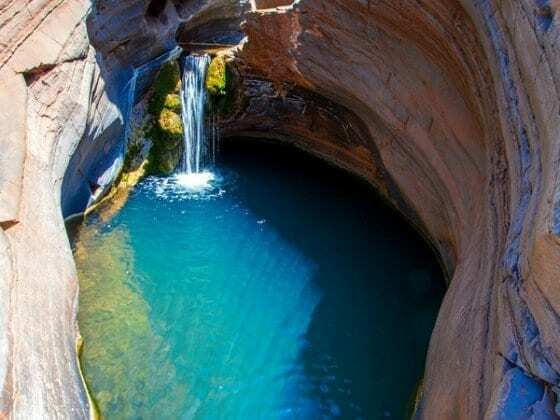 It’s a special place…last year i went this place ……..it was amazing moment For my life…..i hope i will go next time….. thanks y travel for sharing with us…..
Wow, Carnarvon is beautiful. 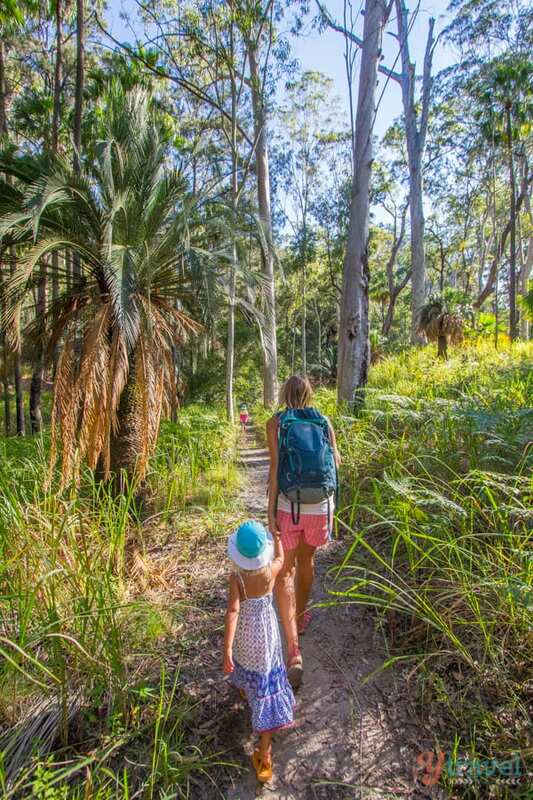 What do you use to carry and protect your camera while you are hiking with your family? 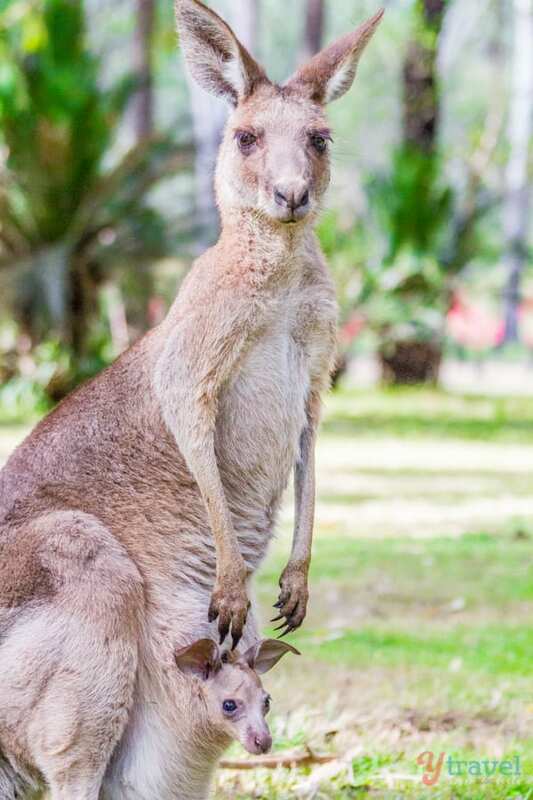 So want to travel to The land down under. I am in Thailand right now . Your article makes me want to try there next.Enjoy! Some overseas travellers think that the east coast of Australia is overrated but that is because thay stick to the popular tourist towns and don’t explore what the region has to offer.i read alot of travel blogs written by British people and never mentioned Canarvon Gorge .You only hear about Cairns ,Daintree rainforest ,Barrier Reef ,Whit Sundays,Frazer Island Noosa ,Surface Paridise and Byron Bay.There are alot of beautiful national parks to explore that are not even mentioned.i am so proud of you both for stepping out of the circle and showing us of beautiful nature that not all travellers get to see.keep up the great work. it was beautiful to see howit has evolved and seems more beautiful than before. I amt old and incapacitated to go there again and say a big thanks you for your report and pictures. Drove to Carnarvon NP many years’ ago. Camped for a week. Walked all the walks, swam in all the water holes. Sat under cascade at Moss Garden. Climbed up rickety ladder to Amphitheatre. 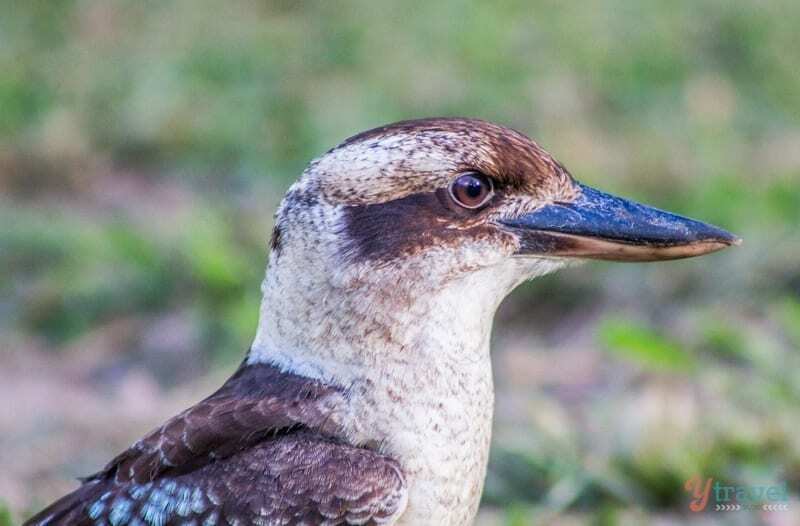 Had a magnificent coloured Kookaburra sit on our 4WD back-door top, watching our every move packing up from breakfast! He was given some fresh mince for his ‘security work’! Lol! We towed out a VW that had gotten bogged at entrance. 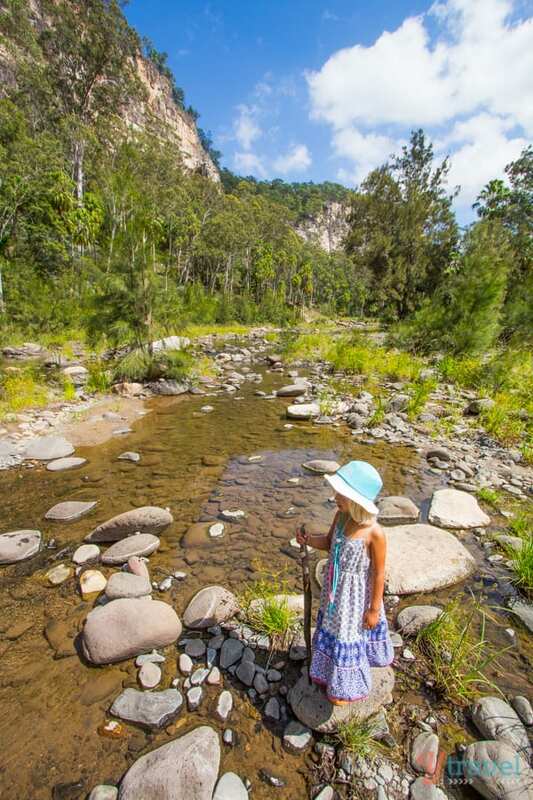 Loved the campsite, & the magic of Carnarvon Gorge. Thanks for sharing Elizabeth. 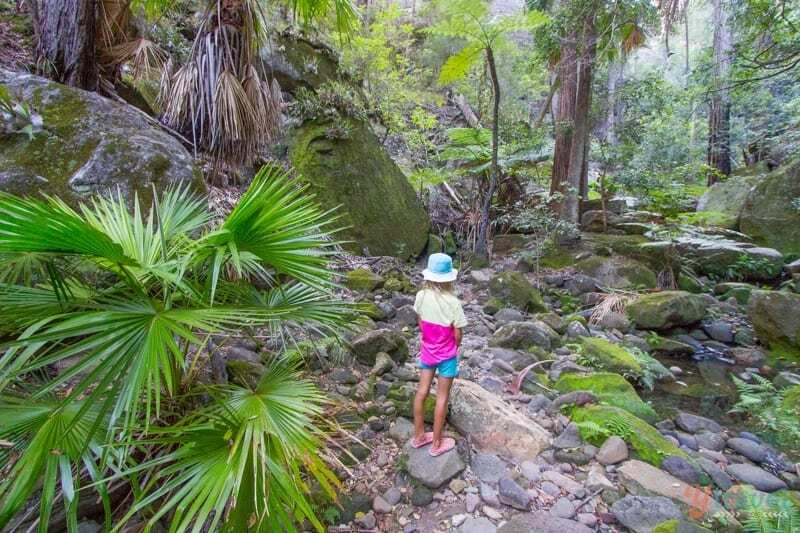 Glad you loved Carnarvon NP! Glad to see you loved Carnarvon, Caz. We have been there many times and love it also! The Western side (Mt Moffat Section & Salvatore Rosa) is also special. The only other comment I would add – You said “Savannah ended our 18 month road trip with diva demands to be carried everywhere”. 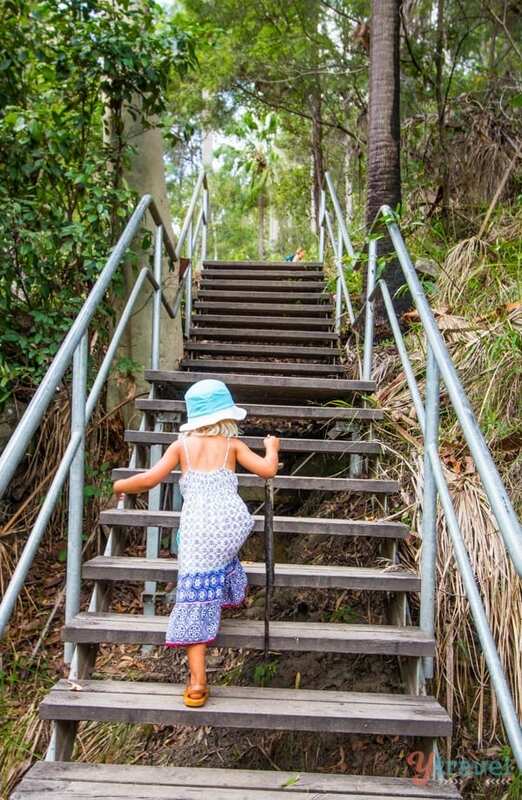 I’m not surprised, if the poor little poppet was only wearing thongs as per your photos – hardly suitable for bushwalking! Carnarvon is not really remote. Fuel is available at both Injune and Rolleston, and Roma is actually quite city-like. 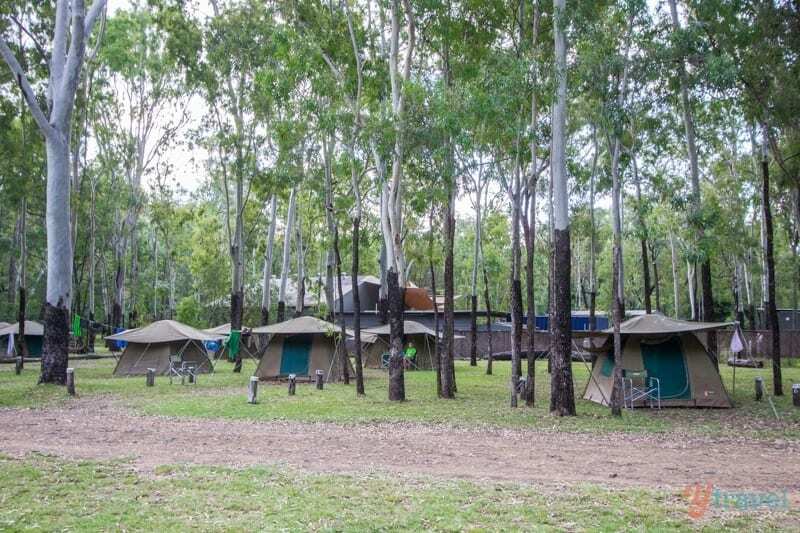 There is a resort attached to the park which offers a range of accommodation. 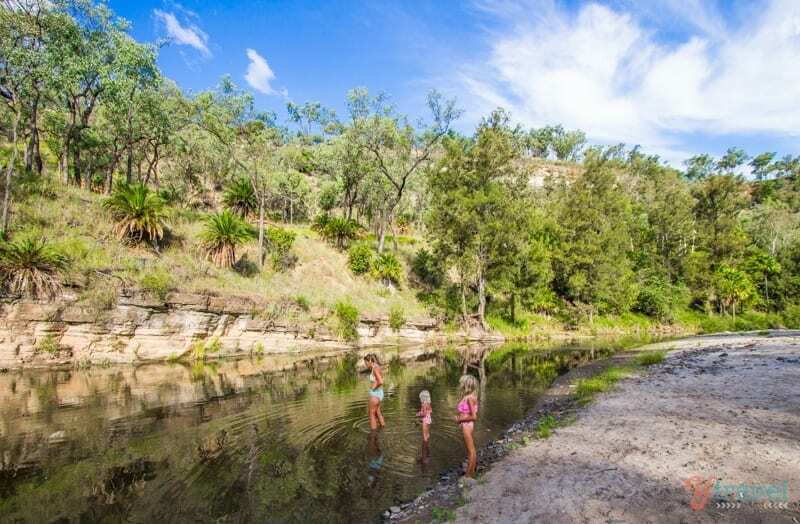 Not many people know that the Warrego River rises at Carnarvon (it is the northernmost extension of the Murray-Darling basin). Rivers radiate from the (admittedly not particularly high) mountains but over the full 360 degrees. Yes, like most places in Queensland, when it rains it actually rains! But the road access now is vastly improved over the fifty plus years of our visiting the park. Also, modern computing has improved weather forecasting – definitely check in and keep up to date. 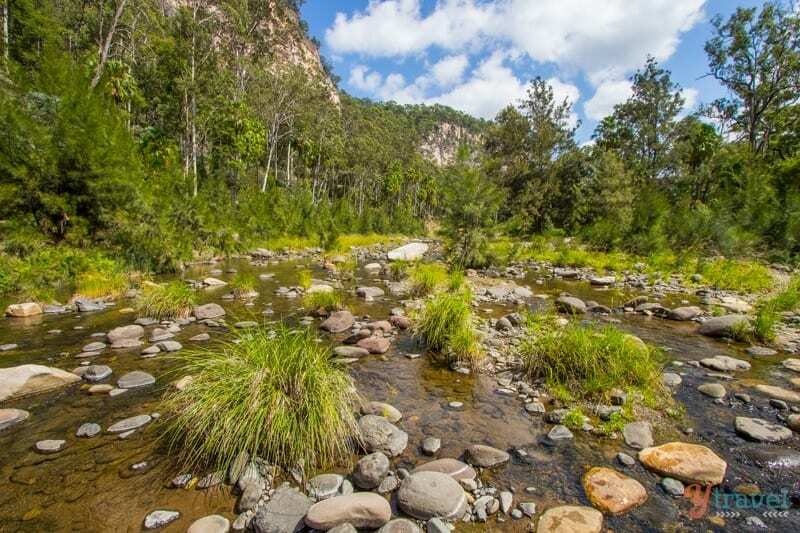 I am very fond of Carnarvon Gorge National Park trip as it is a warm destination in Queensland. I wish to visit the place next year too. What a fantastic review. I have skirted the Gorge many times on business trips, using the Injune-Rolleston road, and had a glimpse of the fringes of this place. Which were fantastic in their own way too. Cheers Kimball. 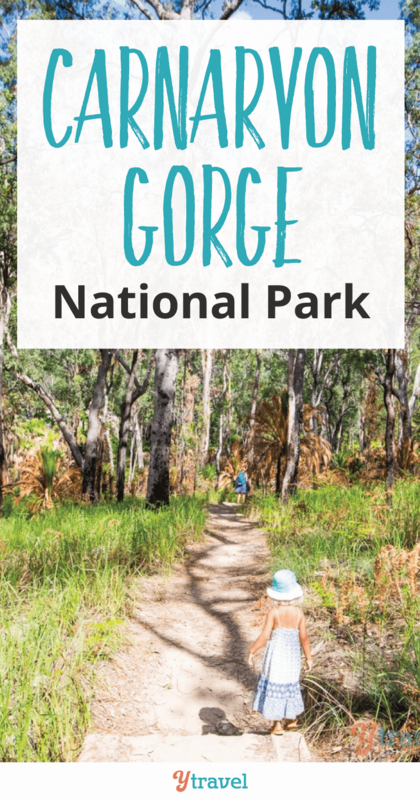 Carnarvon Gorge was a big surprise for us! Hi Lea. It’s our first visit to the area. We can only write about what we experienced, at the time of year we experienced it. I found an echidna near the camp. It rolled into a ball when I went to touch it. 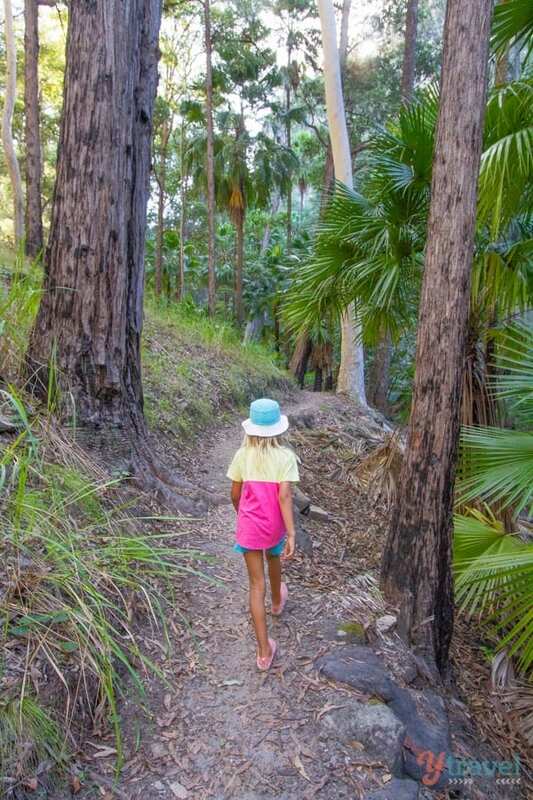 How old were your kids when your visited Carnarvon? We are thinking of visiting with our 5-1/2 yr old but not sure what the walking-to-whining ratio will be. Hi Dan, our kids are 8 and 4 and managed pretty well. Like all walks we do, take water, snacks, and frequent breaks. Oh, and a sense of humour. You’ll love this park!